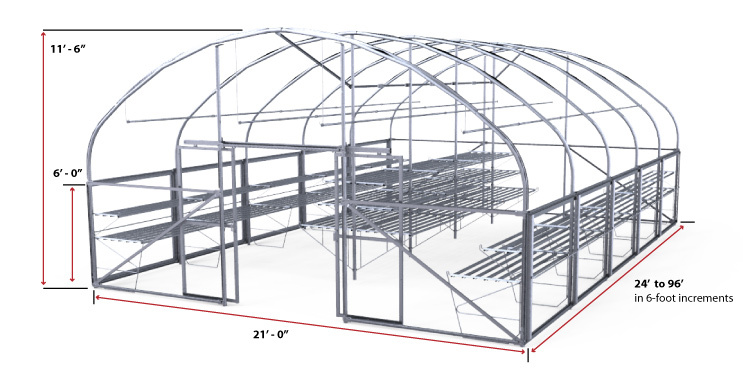 The flagship of our line, this greenhouse combines exceptionally easy setup with great standard features and convenient options. Engineered for superior strength and customer comfort, the Garden Mart can be custom configured to suit your specific needs. The modular design also makes future expansion a snap! Slide-Side Base Package: The Slide-Side base package is the perfect start to seasonal retailing and includes the Slide-Side ventilation option for your Garden Mart. It contains the galvanized steel frame with Snap2000™ design for easy setup, hanging basket purlins and integrated side wall and center benching brackets for use with our bench tops when you purchase either the Standard or Expanded Metal Bench Top Package. assemble hardware and assembly instructions. 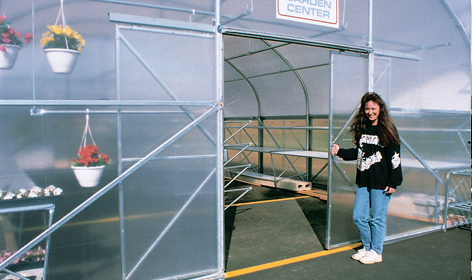 Roll-Up Side Base Package: This package includes everything you need for Roll-Up Side ventilation on your Garden Mart. 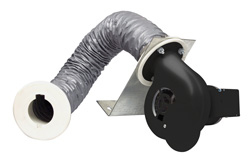 The roll-up side option gives you a wider range of ventilation from fully open to fully closed or anywhere in- between. It also contains the framework and integrated side wall and center benching brackets for use with either the Standard or Expanded Metal Bench Package. 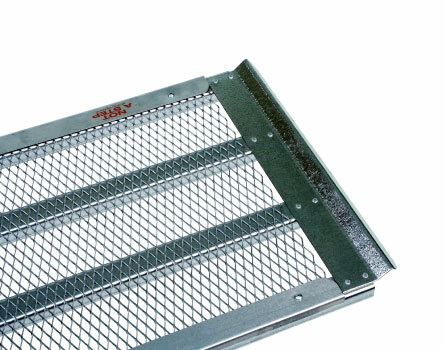 air-flow to keep your product in great shape. stand up to the rigors of a busy retail environment. 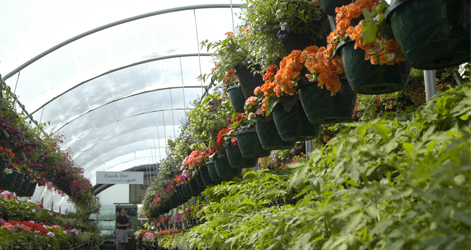 Four hanging basket purlins run the length of the Garden Mart. Two are above the center benching and another two are above the outside benching. Two-tier bench top arrangement: This is the configuration for the side bench tops when you purchase either the Standard or Expanded Metal Bench Top Packages. It consits of an 18” and a 36” bench top and you have the option to purchase the additional lower bench tops for more capacity. Without the optional lower bench tops, this arrangement holds 15 flats per 6’ section. The additional lower bench tops adds 6 more flats per 6’ section. 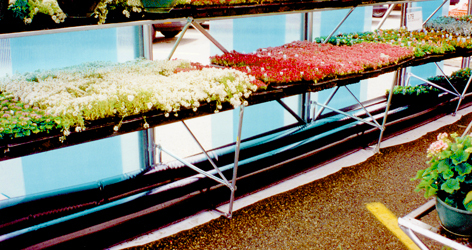 The tiered bench top arrangement is one of the options for the center benching in your Garden Mart. They come in either roll-form or expanded metal style. The tiered arrangement consists of three bench tops, 18”, 23” and 36” in depth. This option creates a cascade of color and allows for more light to reach all of your product. It leaves you with a slightly smaller aisle (4’6”) and can hold 21 flats per each side of a 6-foot section. 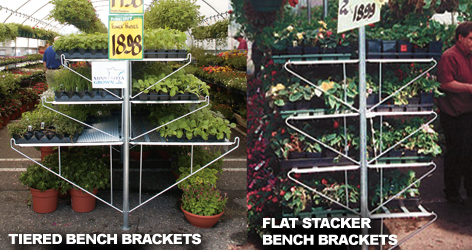 The flat stacker bench top arrangement is one of the options for the center benching in your Garden Mart. They come in either roll-form or expanded metal style. The flat stacker arrangement consists of four 18” bench tops ‘stacked’ in a row. This option gives you a wide aisle (6’) and can hold 24 flats per each side of a 6-foot section. 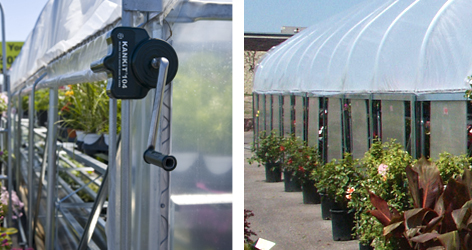 to keep your Garden Mart secure and protected from high winds. These are our basic bench tops included in the Standard Bench Package. They use connected “slats” of galvanized metal to create the bench top and are the less expensive alternative when buying bench tops for your Garden Mart. They are perfect for displaying flats or any product that is more than three inches wide. If you need the versatility to be able to display smaller items, then our expanded metal bench tops are for you. These bench tops are provided with our Expanded Metal Bench Top Package. On top of our Roll-Form bench top, we add 20-gauge, galvanized, flattened expanded metal for more versatility when displaying small items and hard goods. Wire basket attaches to bench top to hold related merchandise. 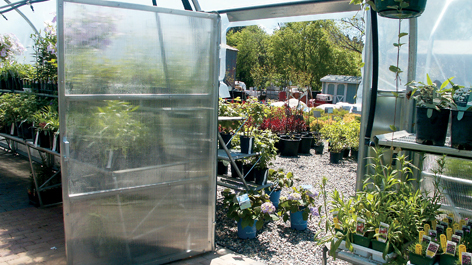 Slide-Side Base Package Pricing: The Slide-Side base package is the perfect start to seasonal retailing and includes the Slide-Side ventilation option for your Garden Mart. 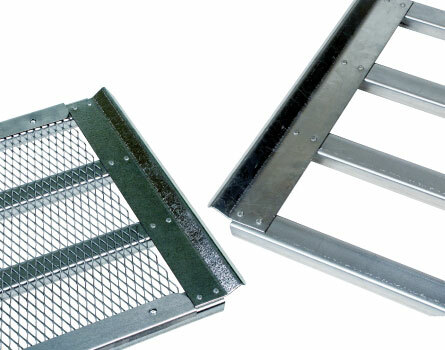 It contains the galvanized steel frame with Snap2000™ design for easy setup, hanging basket purlins and integrated side wall and center benching brackets for use with our bench tops when you purchase either the Standard or Expanded Metal Bench Top Package. Can I leave the Garden Mart up all year long? Yes. You can leave it up all year long in most parts of the United States. It is strong enough to hold up to heavy snow loads unheated. You can also remove the poly covering and remove the slide side panels and the frame will withstand wind and snow. Can I buy the Garden Mart without bench tops? Yes. Check our pricing page for the Garden Mart. There is a listed base price without the bench tops. This price includes the built-in benching brackets and is ready for your own bench tops or you can purchase bench tops separately from us at a later date. Keep in mind that it is less expensive to ship the bench tops with your Garden Mart order than to ship them separately at a later date. What are the advantages of a double poly roof? Inflating two layers of poly film will give you a tighter layer that will flap less in the wind and therefore will last longer. It will also give you a dead air space that will help to insulate the greenhouse. We recommend a double poly roof for anyone in a colder climate. Additionally, in a retail greenhouse such as the Garden Mart, the inflated roof will look nice and tight and generally give a more finished appearance. How long does it take to set up the Garden Mart? It depends on how long the Garden Mart is. 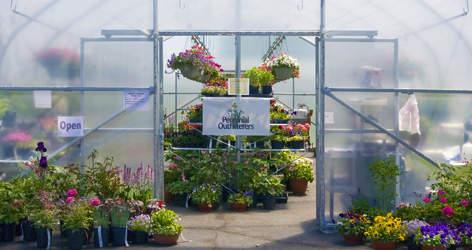 Generally it takes 3–4 people 6–8 hours to set up a 48-foot Garden Mart. Variables such as how the structure is anchored, single or double poly roof and additional end or side doors can increase this time. Why would I want expanded metal bench tops? Expanded metal mesh bench tops are very nice for displaying a wide variety of plants and products. Our standard bench tops are really designed mainly for displaying flats. So if you plan on displaying potted plants, hardgoods and other products then you should purchase the expanded metal bench tops. Also, if you are not sure and would like to purchase them at a later date, please see our expanded metal retro kits.